A new daily talk show from Illinois Public Media is celebrating its first anniversary. 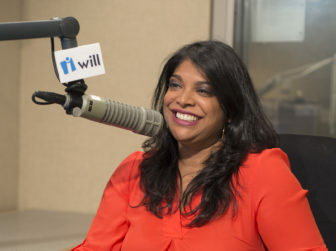 The 21st aims to cover news across the state of Illinois, and host Niala Boodhoo has a lot of big thoughts about what a talk show should be in the 21st century. Boodhoo appeared on a recent episode of our podcast The Pub to talk about her show, how it’s using social media, and its potentially puzzling name. This transcript has been edited. 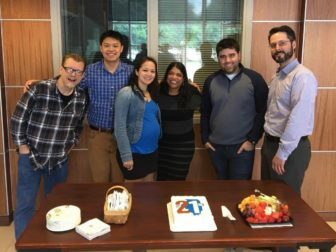 Niala Boodhoo: So The 21st, for everyone who wonders about the title, it’s 21st-century radio for the 21st state. Illinois is the 21st state to join the union. Adam Ragusea, Current: Of course, everyone knows that, duh. Boodhoo: Of course very few people know that, but part of the point of this show is that we’re bringing everyone together across Illinois. We started at, and have always been a production of, Illinois Public Media and Champaign-Urbana WILL, which has great roots in the history of public radio. I love walking around this campus and seeing the roots of things, like the precursor to the Corporation for Public Broadcasting; a lot of those organizations actually have their roots right here on this campus at the University of Illinois. I love that the broadcasting roots run very deep in this town and in this community. The idea of The 21st was something that our CEO, Moss Bresnahan, and news editor Scott Cameron, formerly of Talk of the Nation, had really thought about. There was a fantastic local show that had been on the air for 30, 40 years called Focus, and that show had been taken off the air about two years, a year and a half prior to me joining WILL. Current: I’m sorry, I was just chuckling because Focus is just so what a public radio talk radio talk show founded 30 years ago … back then it was Focus, and now it’s something obscure that needs an explanation. Boodhoo: The 21st? Yes, I love that name; I came up with that name. I have to say, it took a little bit of convincing to get everybody to buy into it. Current: At least you didn’t do something that was like, State of Affairs or “state of” something or other. Boodhoo: “Talk of Illinois.” Yeah. It’s very funny when you start something … this has been a great experience for me. It’s one of those things where I said, “Oh, I want to have a startup,” and now I’m like, “Oh, I have a startup.” There’s a lot that goes into that, but the name was a really big part of it. Current: The name is no small thing. What was the talk show in Chicago called that the name of the show is the street address? Boodhoo: Eight Forty-Eight. That’s another one that no one understood because 848 E. Grand Ave. is the address of WBEZ, and people were very confused because they thought the show came on at 8:48. Actually it started at 9, and at one point it started at 8:50. Now it’s called The Morning Shift because that was sort of part of a rebrand; there was The Morning Shift and The Afternoon Shift. I was The Afternoon Shift, and then there was The Morning Shift. Current: Exactly. You get it and, again, it’s unlikely to be confused for a time unless you know someone living on base and you’re thinking about military time or something. There’s three basic archetypes of local show names at this point. There is a pun on the word “state” if it’s a statewide show. There is some sort of internal industry lingo thing that no one will understand unless you work in the industry. Current: Or On Point is even one. That’s industry lingo, to keep the guest of the conversation on point. And the third archetype is the new archetype, which is the thing that has meaning that is not immediately apparent to anyone and usually has a number. Boodhoo: Oh, interesting. Yeah, I guess I’m in the third category. Current: Oh, you so are. Boodhoo: The other part of this though, Adam, is I really wanted to reflect the whole idea of the 21st century because we didn’t want it to just be a call-in show, because that’s not really how our audiences are anymore. We have a lot of vibrant interaction on social media. Bizarrely, we found Reddit to be one of the places where people are most engaged with us. I also wanted to reflect the show as a bridge between a traditional old-school public radio call-in show and something that we’re hoping is new, because I really do care very passionately about bringing new audiences into the public media family and into public radio and learning about that. And I think for that we have to go where they are, right? Current: Yes. When you and I chatted informally about the show when you were first starting it up, one of the things you said to me was that you’re kind of envisioning it like a social-first program: It’s social first and it’s radio second. Boodhoo: What we do when we’re at our best is that we are preproducing the conversation through social media, and we’re getting a sense of what is happening through … I’ll take a perfect example: Illinois is in the toilet in terms of our budget situation; we’re almost two years into not having a state budget and it’s kind of been a disaster — not even kind of, it’s been a disaster. Last year, when we thought it was a disaster and we were only a year in, I had an idea for one of our first programs. I thought we could do “Everything You Ever Wanted to Know About the Budget but Were Afraid to Ask.” I thought that there were a lot of people that maybe had questions about the budget impasse that they wanted answered. We took a lot of those questions and we framed all of that, and that’s how we decided to produce that hour of radio. We just picked all of these topics and we saw the questions people had. Then I lined up experts and talking heads and those sorts of things. And then we actually went out and did the traditional vox and talked to people and said, “What questions do you have?” We put all of that together, and that’s how we produced that show. Current: You’ve also been using Anchor a lot. Could you tell me what that is? Current: That would be in the category of industry lingo. Boodhoo: Right, so you send out a wave and then people who follow you respond, or [even who] don’t follow you, because Anchor can sort of elevate it and put it in front of people. We did this actually with third-party candidates. I asked people about Gov. Rauner, what they thought about him, just because it was sort of testing people in Illinois. So that’s how we use things like Anchor. Current: Let’s listen to a clip. Current: That guy, we got to find that guy, find out if he’s OK.
Boodhoo: The great thing about this app is that then those people have conversations with each other. On Anchor, when you go into the app, they’re responding to each other; someone else is responding to that guy. It does become a little Reddit-like, where you can go deep into a sub-conversation; someone went into a whole Hillary conspiracy, again very in the early election process. Donald Trump was a candidate that had been put up by Hillary Clinton because no one thought he would win, and this was a way that Hillary was going to ensure her victory. And that’s why you should vote for a third-party candidate. They did bring it back around, but the fascinating thing about Anchor is you can see the conversations happening. It’s a really easy thing; you just pick up your phone and you respond. Anchor rolled off some really cool things. In fact, I was going to ask you about this because I was thinking we should have recorded our interview this way. We haven’t had a chance to test it out yet, but they have ways that you can record interviews back and forth now via Anchor, too. I’m not sure about the sound quality. Current: It’s worth giving it a shot. I don’t know if this is how you’re explicitly branding yourself, but as I listen to your show, my sense is like this is the daily talk show for all of Illinois that’s not Chicagoland. Is that fair to say? Boodhoo: I think so. I think that, interestingly, we have a lot of people in Chicago who are also listening, but a big part of our conception of this is that there is a huge media landscape in Chicago that is very well covered, and that is not necessarily the case outside of Chicago. We really did want to create a conversation. Now, as we’ve done this, and especially as we’ve seen with people in Chicago, a lot of my old audience, other people who are picking up either the AM signal — which actually stretches to Chicago, where I was kind of shocked when we get a caller from the suburbs — and then people who are listening online. A lot of people are listening via NPR One via the app. They’re listening after, but the live listeners are listening via our web stream. There is really — just like most states with a very large urban center like Chicago —a bit of a disconnect. There’s Chicago and then there’s quote-unquote “downstate,” which is essentially anything outside of Chicago. It’s kind of funny, as I’ve moved down here. I think people in Champaign-Urbana do not necessarily consider themselves downstate, but then people who are further south, they’re like, that’s downstate. And, of course, in Chicago anything south of [Interstate] 80 is downstate which is not, if you look at a map, technically downstate. You could be north in DeKalb, which is our newest station, maybe that’s considered downstate, too. Current: It’s the exact same thing here in Georgia with Atlanta. Boodhoo: I do think that there is a need to connect those audiences, because the irony is there’s a significant population of the city of Chicago that’s from the rest of the state, that has moved to Chicago, and they are from all of these places. While we recognize on the show that there are a lot of important parts of Chicago — and there are a lot of important guests and news and things that happen in Chicago just by virtue of it being the third-largest city in the country, that’s going to play an important part in the show — that’s not the entire show and that’s not the focus. We see our role also as aggregating a lot of the work of journalism that happens outside of Chicago and elevating that to a level, for example, whether we’re talking about the Peoria Journal Star or the Pantograph in Bloomington or The Southern. There are a lot of newspapers, there are other websites, there are folks that are doing great journalism that maybe do not get as much notice because they’re only getting that local area. That’s a large part of what we’d like to do on the show as well, as sort of serve as an aggregation vehicle and highlight the work that other journalists are doing and bring that to everyone else in the state. Current: So you’re based at Illinois Public Media in Urbana … and that’s where you work, that’s where your paycheck comes from, that’s what funds the show. But you’re on several other stations. You’re on in Bloomington, you’re on in Springfield, where the state capital is. What’s the economic model of the show? Do you make money from those stations for the carriage rights? Boodhoo: We actually offer the show to other stations free of charge. They just have to carry our underwriting. It’s a pretty good model, and when we launched last March the whole idea of the show was conceived in partnership with WUIS in Springfield. They were a partner on board from the beginning, and then we added in other partners. We did sort of a soft launch last March, we went daily last May and we added [WGLT in] Bloomington–Normal in May, and they took us daily in July. WCBU in Peoria picked us up — they carry the show at 6 p.m. — and then starting May 15 we will have WNIJ, Northern Public Radio, in the DeKalb-Rockford area; they’re going to be carrying as well live. Current: Congratulations. I think people listening would be curious to know what your staffing levels are. How many positions do you have on the show? Boodhoo: Yeah, that’s a great question, a very important question that people ask. We have two full-time producers whose full-time job is to help produce the show every day. We also have two engineer/technical direction/promos — all of that stuff — so we have two people who have other duties at the station but also spend a large time working on the show producing. Most of the show is live. We really do try to do live every day, and we really want to stay true to that. But elements like our billboard and our promos and things like that, we have two people who work on that. Current: Is it like you have one of those people per day, or both of those people on a given day work on the show some of the time? Boodhoo: Both of those people. Jason and Steve are engineers and technical direction, and they will trade off. We have the two producers, and Scott Cameron is our executive editor. He also has a new position now running the Illinois Newsroom, which is a new collaboration that WILL is also launching between five other stations. That’s a reporting collaboration, kind of an LJC [Local Journalism Center], being supported by the Corporation for Public Broadcasting, the McCormick Foundation. Scott comes from Talk of the Nation, and Scott loves talk shows, and a lot of The 21st came from his and Moss’s desire to create something like this. Scott has, I would say, a pretty significant hand in our daily production and helps as needed. And then we normally have anywhere from one to two interns. The other part of our team — that we actually haven’t talked about yet, they sit in on our daily meetings — there is sort of a collaboration we’re doing with the University of Illinois. The University of Illinois has a very newly launched social media analytics lab, and so we have two guys who work analyzing social media, working with tools like Crimson Hexagon, and know Excel, where they have an ability to go deep into social media, and they do a lot of our research for us. … When we are looking at things like different hashtags, Crimson Hexagon is a tool that brands use to monitor how people are talking about them. … [I]t’s a very expensive tool that the University of Illinois uses, for example, to monitor the University of Illinois’s brand. They also have a line of different search engines, searches that are available for research purposes. When I got here, this is one of the things I was really interested in doing. I would say a really good thing about the university licensee is, this is the one place that the show works with the university and that they have let us have one of those search lines. Nick and Joe, who are the guys who run this lab, sit in on our weekly enterprise meetings, and as we’re talking about the different things we want to do, Joe and Nick are searching. Crimson Hexagon allows you to search any public tweet, Facebook post, blog comment, headline, public Instagram, and you can geolocate that … . So, for example, if we want to see what people are saying about Gov. Rauner and the budget, we can do a search of that. The perfect real-world example of this was last week there was a movement started by K-12 school superintendents in Illinois; they created a hashtag #passabudget. We were able to give that to Nick, and he was able to run it and say, “OK, they created the hashtag this day. This is how many original tweets they had.” I think originally — gosh, I have to go back to my notes — I think the original tweets were like 1,700, but then they got like 3,500 retweets. We are also able to see who’s tweeting; if we want to go really deep into the data, we can see the people who were retweeting, we can kind of pull out influencers of who were the people who were having the biggest media influence on that conversation. For example, whenever Chance the Rapper says anything about Illinois politics, it’s immediately the most influential thing that’s ever happened in Illinois. Before Chance blew up last year, he said something about MAP [Monetary Award Program] grant funding, which is a kind of obscure funding but a very important one for students for financial aid. He tweeted about it last year, and that’s still — if you look at Illinois politics and a Twitter event — like the most significant thing that has ever happened because Chance tweeted about it. So it’s kind of cool because you’re able to see influencers. We’re actually even able to drill down into the demographics of looking at the people who tweet about the past Illinois budget, what other things they tweet about, so we can see that. We actually got both of our guests that we booked for the segment from Twitter as well, because we were just searching through the hashtags. We actually booked two different school superintendents, one of whom actually turned out to have originated the hashtag from Twitter. Current: Let’s listen to a little clip from that episode. Current: Niala, as we finish up here, based on your experience in the last year, what tips do you have for your colleagues in the system for doing a daily talk show in the 21st century? Current: Give me an example … because I’ve seen this happen so many times. I’ve worked on teams that have done this: You go into something to start a new show and you’re like, “This isn’t just going to be a radio show, it’s going to be a multimedia experience.” And then it winds up just being a friggin’ radio show. Boodhoo: You have to choose your battles. I don’t try to do that, because we do not have the resources to be providing a multimedia experience. But what we do is we try to produce a very consistent great hourlong daily program, and then we try to make sure that the elements of that that we think are going to be sticky online — we produce audiograms, we put elements into NPR One. It’s very interesting, and I’ve had some good conversations with NPR One about just using the show and having people discover that. So I actually push NPR One as the vehicle for how people can find the show because we get all the data on that. And we do see how sticky it is, like the elements of the show that we put into NPR One as well as the whole show. So you have to pick your battles. I think this school superintendent conversation is a good example of that, which I wouldn’t say was “so public radio,” but I do think that we have to have those conversations. We have to have conversations about the budget. But I do appreciate that we got two school superintendents, and we booked them entirely via social media. I just think keeping those models open is really important, and maintaining that as a standard is really important because that’s how you allow more people into the process. We’re more transparent, which is really important to me. I think we allow for more of a diversity of voices if we are using these vehicles for booking, which is also something that I think is very important for us and for the future. Oh, I thought of a “very public radio” segment. It was called “Prowl,” when we had this guy — this is what I love about public radio though — we had a guy on who was doing owl voices, and it was for Starved Rock, which is a beautiful state park. He was taking people on what he called an “owl prowl,” and he on air started doing the calls that he did to attract owls. He’s a real biologist. It was the best. Current: You are right. That is literally the most public radio segment ever. Boodhoo: I have to say I love it, it was so funny. It was one of those things where I had to really … the whole control room, everybody knows not to look at me because I’ll just start laughing. It was great. I loved it. Again, that was a five-minute segment, right. We keep those segments short because … if we had talked to that dude for an hour, that would have been old-school public radio. So we had a five-minute segment, and I think that’s maybe a new model. NPR says the new show is public radio’s biggest program launch ever.